The Freightliner Argosy has increased durability using its eRail technology, which cleverly keeps electrical harnesses away from critical engine components. Maximum power is provided either via a Detroit Diesel DD15, Cummins ISX/Signature EGR or Cummins X15e5 with ADEPT technology, a massive 1,650 square inches of cooling to deliver more capacity and efficiency. Having the comfort of a truly spacious cabin and swing-out steps designed to improve safety, mean drivers are more productive for longer. Offering the best from North America’s best engine manufacturers, Freightliner’s New Generation Argosy has the power you can trust. With a choice between Detroit Diesel’s ground-breaking DD15 or Cummins ISX/Signature/X15e5 power plants. With up to 600hp and 2050 lb-ft of torque on offer, and all of it ADR80/03 compliant, there’s barely a load the Argosy won’t handle with ease. The Argosy has got your back. Option of Detroit Diesel DD15 engine with up to 560hp (418kW), 1,850 lb-ft or Cummins ISXE5 SCR engines with up to 600 hp, (448kW), 1,850/2,050 lb-ft.
Detroit Diesel’s DD15 market leading warranty – “Extended Warranty Agreement” (EW2) provides operators with peace of mind: 5 years*/1,000,000 kilometres*/500,000 litres fuel burn*/15,000hours*. Smoother, quieter engine with integrated Jacobs Engine Brake means lower emissions, lower noise and reduced vibration with the Detroit DD15. Available with Eaton Manual, or UltraShift with SmartShiftTM paddle. It’s arguably the roomiest, most comfortable and safest cabin on the road. Any road. For a driver, the New Generation Argosy has it all – from the legendary swing out steps, to a completely flat floor and up to 6’7” of headroom. Add to that Seats Inc. XTREME HD air suspended seats, a fully adjustable steering column, ergonomic dash and up to 51” wide bunks, you can understand why it has been called the world’s most comfortable workplace. It’s got your back. Ergonomic dash – lowline instrument panel for improved visibility. Burl wood grain with bright finish instrument bezels, ivory gauges. SmartShift™ fingertip control over Eaton UltraShift. Electric windows and door locks. Adjustable steering column with telescopic and tilt capacity. Spacious ‘stand up’ driver friendly living area with up to 6’7” of headroom for easy cabin movement. Large bunk and sleeping area. Range of bunks up to 51" wide with twin bunk in raised roof option. Swing out driver’s side staircase with optional passenger’s side staircase for safe cabin access. Cabin’s ranging from a 90” mid-roof sleeper to 110” raised roof sleeper. 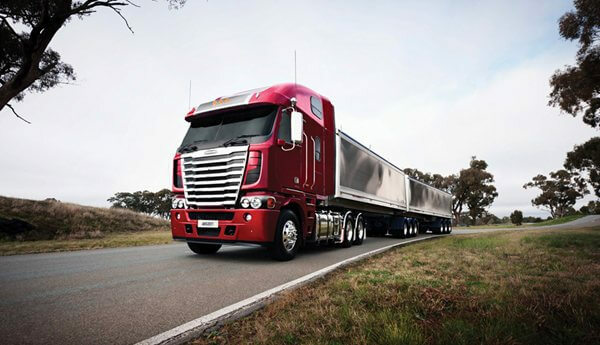 Subscribe to the Freightliner YouTube channel to see our tough trucks in action!